Cheesy pies with honey and sesame seeds. Oh yes! Tyropitakia are Greek cheese pies. I’ve changed them up a little by using sesame and a chilli infused honey. And I’ve paired them up with a new, special beer. That time of the year is slowly approaching! Summer time. Although it feels like it’s taking its time, the clouds are slowly disappearing and the sun is shining. It’s definitely warmer and before we know it we’ll be smothered in humidity. My remedy for keeping cool? Yes. You may be spoilt for choice in this area but I want to talk about a special Japanese beer. Asahi Super Dry Extra Cold. This is no ordinary beer! This unique beer is brewed using the best quality ingredients. It’s best served at it’s optimal temperature of -2 deg C.
By keeping it this cold you end up with more flavour and a dryer refreshing taste. A beer this good needs even better food to go with it. When I was asked to come up with a recipe to pair the Asahi Super Dry Extra Cold, I naturally went with something Greek inspired. “Tyropitakia” or mini cheese pies. 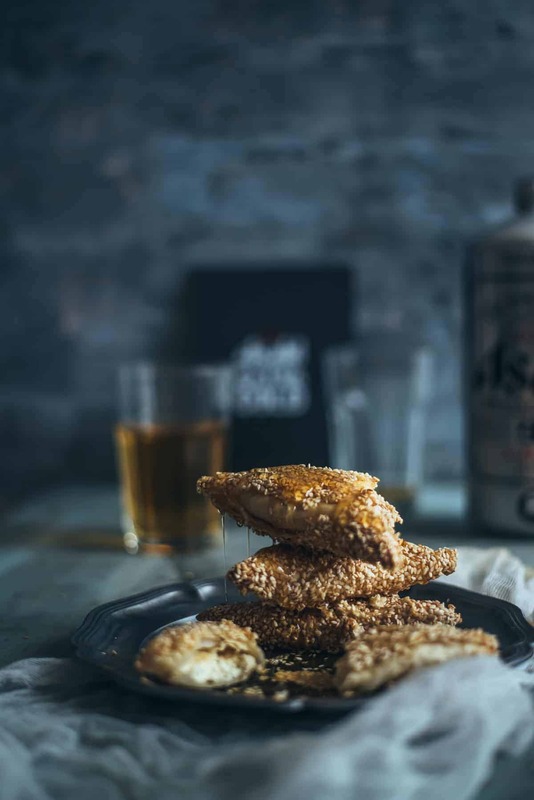 Tyropitakia are the perfect snack food for this beer and I’ve attempted to add a few different touches to the traditional recipe. I’ve coated my cheese pies in sesame seeds and smothered them in a chilli infused honey! The filling is a mixture of fresh ricotta, salty feta and pungent Pecorino. It’s finished off with a little nutmeg – which works well with the cheese. It might seem like there’s a lot going on but it all comes together perfectly. Crispy, warm tyropitakia. Salty, slightly pungent filling. Spicy honey. They’re the perfect match for this unique beer served at sub zero temperatures. enjoy! Scroll down of the tyropitakia recipe. Tyropitakia are Greek cheese pies. This version uses a sesame crust and is drizzle with a warm, spicy honey. In a large bowl combine the ricotta, feta, Pecorino, nutmeg, pepper and 2 eggs. Mix thoroughly to combine and set aside. Place one heaped tablespoon of the cheese mixture on the very top of the sheet allowing a few cms of space and press down lightly. Fold diagonally to form a triangle, then continue folding ensuring you keep a triangular shape. (Any excess fillo that remains can be “tucked in” by brushing it with a little extra butter). Continue with the remaining fillo and filling until you end up with 20 pies. Dip each pie in the beaten eggs, drain any excess and then place onto a plate filled with sesame seeds. Cover each pie with the sesame seeds until all are done and bake in the oven for approx. 15 mins until golden. When the pies come out of the oven allow them to cool for 5 minutes before drizzling them with the chilli infused honey. To make the chilli infused honey warm one cup of honey in a saucepan over a low heat, transfer to a heatproof jar and add 2-3 dried chillies. This can be made a few days in advance. Souvlaki For The Soul would like to acknowledge its partnership with Asahi for this sponsored post. The recipe above was created, developed and photographed by Souvlaki For The Soul using Asahi Super Dry Extra Cold Beer.